The regeneration along the Falls Road has hardly left a brick or paving stone unchanged. It's hardly the same city of crumpling terraced rows where the worse years of inter-communal madness drew the attention of the world's media In the Lower Falls, Divis Tower rises to a solitary height, the last remaining building of what were once the Divis Flats. As I point my camera to photograph the military surveillance equipment at the summit of the tower a Belfast character jokes in passing that I better be careful of what it is I'm pointing in the direction of the military, as they're nervous about that kind of thing. "You might get a shot fired off at you," he says laughing. “They're not that bad surely," I say. “They're bad enough," he says as he walks on, "but then they say you never hear the bullet that gets you." As I cross the road from Divis Tower to another unchanged building The Morning Star hostel, I reflect on the Belfast sense of humour, the fatalism and self-deprecation that runs through it like rivets through steel. On the gable-end of the Morning Star a tender image of The Madonna and Child has been created with skill above a scene of painted sea-waves. I think of Joyce and his church from "whence there streamed forth at times upon the stillness of the voice of prayer to her who is in her pure radiance a beacon ever to the storm-tossed heart of man, Mary, star of the sea"
bells and the intense murmurs of priests celebrating the sacraments. The sense of religion in West Belfast jumps out at you down almost every street you take. The brand of religion there is of the living, breathing variety. There's little enough to see of the Divis area that endured the worse of the troubles. The Morning Star hostel was once an RUC station and retains a structural quality of definite historical significance. Davy, one of the hostel workers, opens the heavily secured door to greet me with a friendly and distinctly Brummie accent. He explains that both his parents are from the Divis area and although he was actually born in West Belfast he was brought up in Birmingham. How many times, I can't help wondering, has he felt obliged to explain his English accent? He sets me thinking about the grey areas of Irish nationalism; how so many links, permutations and contradictions complicate the them and us' argument in its most simplest form. The Catholic soldiers from Irish families settled in England were wearing flak jackets on duty in Belfast to protect them from the bullets from fellow Irish Catholics with a radical political vision of the island they inhabit. The secret of survival for the Irish with English voices would appear to be for them to discard their uniforms and find work in the social care sector. You get a sense from talking to Davy that he has long internalised the subtleties of the Northern Ireland dilemma and knows the political geography of Belfast inside out. Like most of those I meet in West Belfast he considers the peace process to be by far the most positive development since the troubles began. His sense of morality and indignation at the extent and depravity of the violence and civil disorder of the worse years of the troubles is strong and the welfare of the homeless men in his care is foremost in his mind rather than the politics of the day. He tells me about one of the homeless men who strayed into the wrong area during the previous year's marching season and was lucky to escape with his life. They beat him badly, broke his legs and then set him on fire. In The Morning Star men from both communities share the dormitories. Homelessness and alcoholism are as effective as any peace process in uniting those they afflict. Inside the hostel an altar of devotion is laid out in honour of The Blessed Virgin. Above the statuette of the Madonna is a circular, dream-like painted image of the founders of The Legion of Mary with Frank Duff dominant in a saintly visage. Davy's busy chatting with and responding to the concerns of the homeless men as they come and go. At the same time he's keeping an eye on the men's evening meal as it bubbles away in two giant pots. Someone mentions the religious brothers who run the hostel and I appreciate the all-encompassing Catholic ethos of the hostel. Yet although it's firmly Catholic in an Irish conservative vein it's not oppressive in the sense that conservative Catholic institutions tend often to be. We're in the kitchen talking when I ask Davy where exactly do the men sit down to eat. He opens a hatch and jerks a thumb towards a dark hall on the other side of the opening. A Victorian soup-kitchen comes to mind as I nod to a group of men sitting about with hangdog expressions. Time has stood still in The Morning Star as regards the care and facilitation of the homeless. There's an absence of keen young volunteers and outreach workers running eagerly from homeless case to homeless case offering a range of curative possibilities from visiting chiropodists to one-to-one sessions with a life-skills tutor. The only direction it would appear towards rehabilitation in the hostel is the imposing crucifix on one of the dining room walls. At one stage a lay worker from St. Peter's Cathedral just across the road calls in to donate a heavy stack of Catholic newspapers fresh off the printing press. Outside I meet Johnny McConkey, a Falls Road man born and bred who lives with the indignity of the reality of homelessness and alcoholism on the same streets where he played as a child. He's bitter about his predicament, who wouldn't be? He warns me about wandering about Belfast with a voice that so clearly belongs to the South of Ireland. I thank him for his concern and assure him I won't be off for a dander down the Shankill. I do in fact take a trip into the heartlands of Protestant West Belfast, but in a taxi driven as it happens by a former Republican prisoner. The red, blue and white bunting, Union flags and Loyalist paramilitary wall slogans affect me instantly and involuntarily I sit up straighter in the taxi's front passenger seat, if the whole show along the length of the Shankill is designed to put the fear of God into Irish Catholics it certainly works and I'm relieved when we turn off towards the Crumlin Road and on further towards Ardoyne. Like the Catholic enclave of Unity Flats the Ardoyne has gone hardly any distance in shedding itself of a ghetto image. It consists of dreary public housing without community facilities apart from drinking dens that resemble from the outside heavily fortified prisons. Of course on the realistic side security in the area is a priority and it's petty to talk of aesthetics in the light of Ardoyne's history. Yet the windowless clubs with their steel cages enclosing the entrances and barbed wire running along the guttering are desolate features that restrict the view towards a brighter horizon. The children running the gauntlet of hate to the Holy Cross school must pass the bunkerlike constructions in their own neighbourhood and one's heart can only go out to them for experiencing such a grim world of barbed wire and sectarian hatred so early in their lives. Driving from Ardoyne into the city centre we pass the infamous Crumlin Road Courthouse, deserted and curiously anachronistic in its imperial design. The taxi driver is suddenly looking very reflective and morose. "There was some right heavy sentences handed out in there," he says solemnly. Probably the sentence he received himself in the austere old courthouse is not far from his mind as he speaks. I'm dropped off at Castle Street where I set out to walk the Falls. The Falls Road itself is a celebration of modem Irish nationalism. 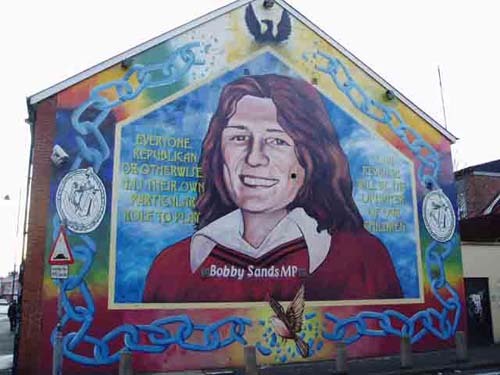 History as translated by the most committed of Irish nationalists is recorded on gable-end walls in the form of murals that in their own right could qualify as works of art in any part of the world. Tri -colours and representations of Easter lilies are strongly in evidence and Republican slogans and war-cries and the letters IRA are spelt out in the most prominent places. An inordinately high number of young men are limping about their business. Everywhere in West Belfast the limp can be seen among the younger male population as if an epidemic affecting ankle and knee joints had hit the Nationalist parts of the city with force. The West Belfast hobble. The favourite dance of the punishment squads of Republican paramilitaries. For a Southern nationalist the sight of the tri-colour fluttering above the streets where so many have died in its name is a truly moving experience. I can almost smelt the blood of the martyrs and hear their final cries of defiance. The mood along the Falls, the emblems and the wall murals bring rushing to the very centre of my consciousness an awareness of my Irishness that's urgent and that dwarfs all other considerations. Belfast is a dangerous place not only because of the threat of violence that haunts the city but also because of the effect it can have a man's patriotic sensitivities. As I walk the Falls I'm charmed by the open and friendly nature of those encountered along the way. The sense of community reminds me of my own working-class Catholic childhood where doors were never locked and where men went down on one knee in the street to pray when the bells of the Angelus sounded. I'm taking photos as I go, of gable-end murals mostly and graffiti on walls. Naturally, the children react to the camera , posing against the political art-work that distinguishes their streets from all others. The day is developing nicely, without rain or excessive cloud. In the window of a butcher shop I have to look twice to make sure I see what I'm seeing. Among the mince and sausages, the ribs and fresh eggs are statuettes of the Madonna. I step into the shop and I'm stepping into a previous age. The old-style scales, the avuncular butcher in his crumpled white coat and the sawdust on the floor transport me to the mind of a five year old staring half in fascination and half in horror at a butcher as he chops meat in a Midland town garrisoned by the military forces of the South. In the Belfast of 2001 I re-discover my home town, the Curragh of Kildare of the 1960s. The famous quote from Pearse's oration at the graveside of O'Donovan Rossa is painted onto a wall in a dead-end street off the Falls. The final words of the quote, 'Ireland unfree shall never be at peace', assumes, one must inevitably assume, that they mean a Nationalist, Catholic Ireland rather than a secular progressive Ireland or a matriarchal Ireland or any other version of an Ireland that doesn't include a lament to a long since sacrificed martyr and to introspective rhetoric in the Irish language. The polarisation in this part of Ireland is an oppressive and despairing phenomena. I weave my way down back-streets and on into the Clonard area. In the next street something is happening. Some kids have chucked a petrol bomb into a derelict building and the fire brigade have been called out. It's a low-key operation for them. They wrench open one of the steel shutters on a window and play a hose into where rubble and rubbish smoulders on the floor of the deserted building. The firemen have seen much, at risk from bombs and bullets as they fought incendiary bomb blazes and the carnivals of fire the rioting entailed. On certain nights as they hurled through the city on their tenders it must have seemed to them that the whole of Belfast had gone up in flames. Later I meander the distance to Milltown Cemetery. The dead are delivered to the day in the shadow of probably one of the most oppressive security centres in the Western Hemisphere, Andersonstown Security Centre. A high tower bristling with surveillance apparatus dominates the sky. I see the Celtic crosses in the same glance as I see the sinister security centre looming in the background and just then history rears up and hits me between the eyes with shocking force. I make my way to the Republican plot to read the commemoration stones. I'm soon lost in the solemnity of the environs but a passing family off to pay respects to their granny's grave jolts me back into reality. I photograph the father with his youngest son and then gather the children for a group shot against the Republican monument. They're a lively bunch. The joy of life dancing jigs in their eyes contrasts so much with the fields of death where we stand. As they rush on about their business one of the little girls pushes a handful of flowers into my hand and I'm touched, charmed again by the Belfast spirit. As I'm passing the acres of tombstones on my way out of the cemetery images from Belfast's past flash in my mind. Images of grenade-throwing intruders at a funeral and the lifeless spread-eagled bodies of two soldiers who also intruded, rattier haplessly it must be said, on a West Belfast funeral. Images brought to the world via the main evening news spin in front of my eyes, spinning above the headstones and fading as the children from the family I'd just photographed wave at me from what I assume is their granny's grave. The spirit of the Belfast people I'd met, their candour and willingness to share the social history of their city with a stranger nourishes the gratitude in my heart and I wish for them the most successful peace possible. They more than deserve it.